When I say I’ll come back to a place, I mean it. Nagsasa Cove is very close to my heart because of the serenity and just like the first time I was here, it still made me want to come back. The first Seoul travel I had was last December 2015 and I was really hoping to experience a snowfall but with no luck and since I was in love with the place, I promised to be back, well not until I have enough savings for such a quite expensive trip! A South Korea travel is amazing but traveling to such a very developed country means spending more money. So this time, I am with Ryan and we scheduled our trip on the mid-January on high hopes that we would be able to cross out experiencing a real snowfall on our bucket lists. It was an 8-day trip and basically, I served as Ryan’s tour guide as I’ve been to places we visited. Upon arrival it was already evening and the weather was at -1ºC and I was on a dress and just a single jacket because my initial plan was to feel the cold temperature because it was scorching in Manila when we left and I overestimated the cold while Ryan was enjoying (his first time to experience winter, btw). We did a homestay at Jin-ho’s House where I was able to book in Booking.com. It was in Bukchon and it was worth all the penny we spent as the place is very affordable and convenient plus we had a closer access to experiencing the South Korean culture. As a K-drama fan, we immediately went to a convenience store to eat cup noodles on a very cold night (ang saya kumain ng cup noodles dun pero ang totoo nagtitipid lang talaga kami, lol). Jin-ho, the owner was very friendly and he even welcomed us with bottles of beer and different flavors of soju. Yes, that’s exactly what we did upon arrival, it was fun though as he also introduced to us the Korean drinking culture. On our first day, we woke up late from all the drinks and exhaustion and we decided to just chill literally and wander around Gyeongbukgung area and visited the famous palace and visit nearby areas like National Palace Museum, Gwanghwamun, and King Sejong statue. In Seoul, coffee is life! We also found this good restaurant where the servers are ahjummas so I thought that food was good and the best part is that they have bulgogi which I was craving for days. It was also cheap considering the generous serving and how good the food was, I just wasn’t able to get the restaurant name as it is in Korean. There’s just too much to love about Seoul travel and one of those things is walking around the streets and getting lost. The environment is clean, no traffic jams, the weather is good and there is good Korean street food everywhere. That night we wander around Bukchon and found this small restaurant and ordered some ramen and gimbap (which makes me crave for Korean food while writing this). We ate here multiple times. The next morning we went skiing which I booked prior to our arrival and we were quite excited because it was a first for the both of us. Even though the ski resort’s snow was artificial, we were so delighted being there. As expected, I had a real struggle skiing, it felt like I slid 5 times and fell down 50 times, I am not really good with balancing but still, it was a great experience and we had so much fun. One ski boot weighs approximately 2lbs. That feeling you get when kids ski better than you!! After that, we were really exhausted and starving and we indulged ourselves in a set of samgyeopsal. We were on our third day in Seoul and there’s still no sign of snowfall, I kept monitoring the weather forecast and it says that chance of snow is 0% which made us somewhat sad. It was during the night that the forecast changed to a possibility of 30% so we stayed awake until midnight to wait but still with no luck. How frustrating! Time for some South Korean culture adventure! Because of our sore body from yesterday’s ski activity and staying up late waiting for the snowfall that didn’t happen, we woke up very late so we then decided to just go to Suwon and walk towards the long stone walls of Hwaseong Fortress. I learned from research that they also offer archery lesson so we tried it too. Fun experience! As corny as it may sound but it was actually the second love lock I cast. Shopping at Myeongdong! As a girl and if you are into makeup, it is one of the best things to do while in Seoul and I really made sure to set aside some money for shopping here. I was really happy whenever sales ladies hand out samplers and I took all of them. Okay, so this is it! It was on our fifth day and we did not expect this to happen because of the previous day’s snow forecast that didn’t happen. I just came from my morning bath when I peek out the window to see how cold it is when I saw a lot of snow falling! Oh, My God, it was snowing, for real!! I exclaimed with sheer joy as I cried out to Ryan who was in the bathroom at the time and we immediately head outside. We felt like little kids and though we’re the only ones out in the cold morning, we were literally dancing through the snow. Gladly, we didn’t catch a cold! Like Myeongdong, shopping is also fun here as the price is much cheaper because its where most students come to shop. We also had some time to visit the beautiful Yonsei University and Ewha Woman’s University. I saved the best for last, walking around Bukchon and touring the Changdeokgung Palace. I really love walking around the Secret Garden because I love trees and the colors of winter here is very pretty. Are you planning for a Seoul travel soon? Ask me a question in the comments section below and I will be happy to help you. In this South Korea travel guide, I will discuss one of my favorite things about Seoul — food trip! During my second time in Seoul, most of our budget was spent on food and I surely gained weight after the trip but I didn’t mind. Traveling to Seoul makes me so much feel at home and their cuisine makes me so happy being there. Thanks to KDramas, they introduced me to some Korean street foods that taste really good — and cheap. The last few days before our trip, I hadn’t much time to eat because of so many things going on. So I was determined to allow myself to relax and eat all the Korean food that I want. Since we arrived at night and we just ate cup noodles at a convenience store, my first proper meal is this bulgogi which I have been craving for weeks. It is a restaurant near King Sejong statue, forgot the name though but it’s just across the street on the left side. After some time wandering around the streets of Bukchon, we came across this small restaurant and we had some ramen, gimbap and rice rolls which are very delightful. This restaurant is located on Anguk station, exit 3. The ahjummas serving the foods were very friendly. A Seoul travel is not complete without samgyeopsal. It is a bit pricey but because we were so exhausted with skiing on the second day and haven’t eaten much on the ski resort as the food is quite expensive, we decided to have samgyeopsal for dinner. On our way to the bus stop for Namsan, we came across this long queue of a small food stall so we joined into the hype. They serve a few selection of toasts and it’s probably the best breakfast we had during our entire week in Seoul. What it makes it so special is that it is freshly grilled and in fact, as the kiosk is very small, you can see how they make the sandwiches. We waited for almost an hour and we get the bulgogi MVP (the bestseller indeed) and bacon best. Considering the price and how good it was, it was worth the wait. At night time, we came back to have another set of sandwiches. Myeongdong is famous for shopping but it is another good place to taste the different flavors of Korean cuisine especially the Korean street foods. KRW1500 ice cream on a winter? Why not! Beer and chicken are quite popular in Korea. Its a usual flavored fried chicken but perfectly paired with beer and some sets of pickles. Perfect combination after a long day of wandering around. Wandering around Hongdae can be pretty tiring. It feels good to walk along the streets, explore the universities and shopping but the tita in me made me easily exhausted plus it was really freezing outside. Good thing we have the freedom to eat and relax for some time! This was our last set of proper meal in my favorite restaurant in Bukchon. Eating this makes me sad because it was our last day and I will surely miss Korean street food and this set of goodies, moreover, this restaurant. But well, at least I have another good reason to plan for a next South Korea travel. Last set of meal 😦 bulgogi ftw! And of course, McDonald’s! The selections and experience are different in every country so I really take time to visit a branch of my favorite fast food chain every time I am in a foreign country. 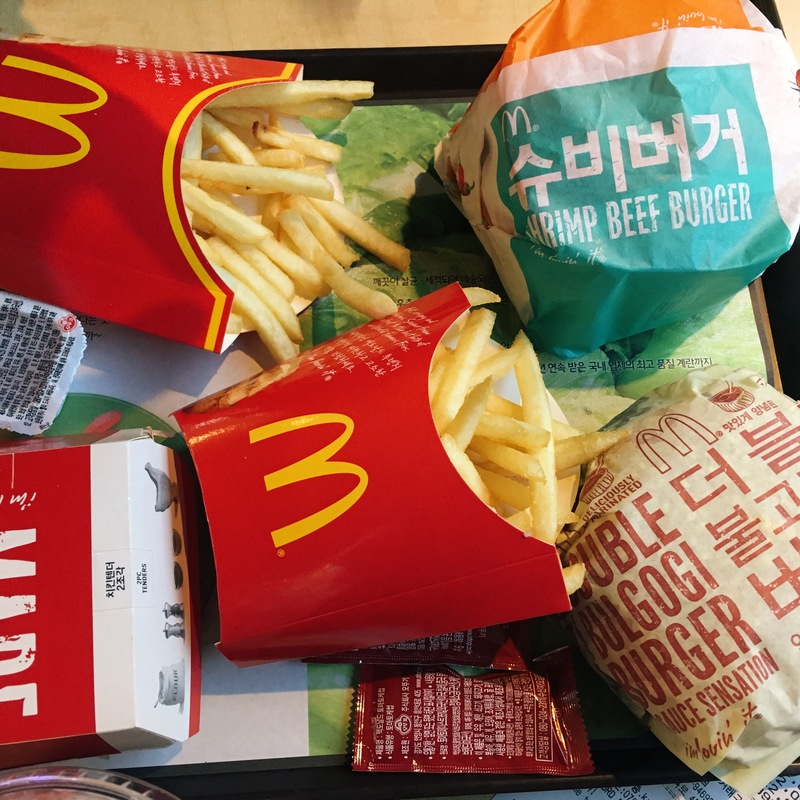 Their menu didn’t disappoint, in fact, Korean McDo has the best selections. Their bulgogi and shrimp burgers are the best! This South Korea travel guide is taken from our trip in January 2017 during the peak of winter. I loved every moment of this trip and I will come back again. Not so soon but I will. For now, Kamsahamnida, Seoul. Are you a fan of South Korean cuisine too? Share your favorite Korean food in the comments section below. Bataan is surely an interesting place for its laid-back environment, not to mention how you can go back in time with Las Casas. We were invited by a friend to join this day tour and since I was really looking forward to visiting Las Casas Filipinas de Acuzar, I immediately said yes! Water adventures are always the best! For this activity, we opted to reserve for a mid-section level which has 24 rapids at Kagay’s CDO White Water Rafting. Since there were only two of us, we were assigned to join this lovely couple for the entire experience. The water may look like brownish and dirty but it was actually clear, the color was due to the rains the night before. The rafting experience took us 3 hours to complete. The price for this CDO white water rafting adventure is worth it. I loved every moment of it and I look forward to doing it again! I have been hearing a lot of great places to see in Baler and since we were on a limited time the first time I was there, I had to say yes when my colleagues/ friends were planning to organize for a weekend getaway to this place. What I really wanted to visit at first was Dingalan Lighthouse because of all the photographs I see on the internet but Trish said it was too far so she just included Dicasalarin Cove to our itinerary, she said they looked almost the same anyway. The road to Dicasalarin Cove was like a smaller version of the Kennon Road in Baguio and when we catch of glimpse of the cove, we were roaring with much excitement. The place was too picturesque we couldn’t stop taking pictures. Hey, that is not a cliff jumping spot, okay? This secluded place was like a haven of peace, we wished we learned earlier that we can do camping here so we could have stayed overnight. Dicasalarin Cove, for me, is like a piece of heaven in the Philippines. Nagsasa Cove is one of the most underrated places I have been to but I found it very close to my heart. I think it because life here is simpler and more peaceful and that is what I have long been looking for. It was our first time to be joiners of other groups which was organized by sir Avel who I came across in one of the Facebook backpacking pages. The trip was actually an island hopping to Camara, Capones, and Nagsasa Cove which we had an overnight stay. The package was P1800, with 3 hosted meals, which is super sulit. Plus sir Avel is the nicest organizer ever, and for that, until now, we still join his organized tours, whether its beach bumming or mountain hiking. We had a very limited time to the first two islets and I was so disappointed as I enjoyed the beach at Capones so much, the water was very warm and it was so clear. We had camping at Pamimi Campsite and the vibe was just what I exactly needed. Unlike those crowded places, I found a much needed inner peace and had a perfect place to relax and disconnect from the all stress and hustles of the city I am currently living in. The place lacks phone and internet signal so I completely disengaged with my phone, yay! I realized that having the time to interact with others feels great since we joined a completely strange groups who became friends at the end of the trip. Aside form enjoying the magnificent view, we spent the day sharing stories, swimming together, taking pictures and it made me appreciate the gift of life even more. Days at provinces like this where there’s not much to do are usually longer and that made me miss living in my hometown. At night, we had the traditional drinking game while telling ghost stories over a bonfire. I guess, this is really usual for large groups to talk about scary stories during outings. The next morning, sir Avel took us to some hiking and cliff jumping and the view on top of the hill was the most beautiful. The way down to the cliff is a little risky though but tiwala lang. My knees were already trembling when we reached the cliff so I chose not to jump anymore before my fear of heights completely dominate me. It was a short stay we had at Nagsasa Cove but it was one of my favorite weekends so I will come back real soon. For four days wandering around Bangkok, we spent most of our time eating and enjoying the wide selection of Thai cuisine. All I know before was about pad Thai and I never knew that there’s more to love aside from that dish when I went to visit Bangkok. From street foods to weekend markets to restaurants, I found that most dish have flattered my taste bud and I realized that Thai food in general was one of the best cuisine I have ever explored. We didn’t have a concrete plan for the entire trip so on our first day we just wandered nearby the place where we stayed and ended up to a street market. The streets of Bangkok were filled with vendors selling different kind of foods. Lisette and I have some list of street foods we want to try and first we encountered was these crispy pancakes or popularly known in Bangkok as Thai crepes . It comes with different flavors and topped with shredded coconuts and some other fruits. It tastes so good, promise. A lot of people were lining up for this crepes so we tried one too. Thais are very much fond of fruits, I saw a lot of vendors selling fruits of all kinds, they even have macopas which I though is a native fruit here in the Philippines. While roaming around Chatuchak Weekend Market, we saw this Spanish guy cooking paella while dancing. A lot of people were buying his paella so we tried it too and Oh God, it was really good. We were just really eating the entire time and we were grateful that foods are so affordable but damn so good. Time for some coconut ice cream! We really tried tasting almost everything out even these colorful drinks and Popsicle, and big-sized yakults! The next day, we went to Khlong Lat Mayom Floating Market for food adventure again, of course. My friend knew about this Thai seafood restaurant called Somboon that serves this very yummy crab curry. We also ordered other seafood dishes, good thing I had my antihistamines. Another thing I love about Bangkok is their convenience stores that sells a wide variety of ready-to-eat meals like pasta and rice seafood meals. We used to buy some of these everyday for breakfast, masarap na, tipid pa! And no Thailand trip would be complete without an authentic Thai massage. The lady massaged me was so strong that I feared for my life but at the end, it felt so refreshing. All the pagod I had for the four days of walking and roaming around were gone. The only temple we chose to visit was the Grand Palace but we were too late because it was already closed the moment we arrived so we just enjoyed the view outside. Bangkok was pretty much like Manila when it comes to various things but I found this foreign country more progressive. It makes me sad actually because I think that Philippines is being left out in terms of economy growth. I have been to some other Asian countries and it makes me feel sad every time I see how they have efficient transport systems. There’s also mild traffics here but look at the vehicles properly lined up, in a way, their motorists are still disciplined enough. I’ve done my research to see if Thailand is considered part of the underdeveloped countries and turned out that it is actually on a middle class. They have some features of a non-industrialized country where some of their facilities are underdeveloped but they are also technologically more advanced to qualify for a first world country. I have always wanted to cross cliff jumping off my bucket list but I haven’t had enough courage to do so until this time. Last December, I saw another cliff jumping spot here in Boracay called the Magic Island but we were unable to go. I heard about Ariel’s Point from Lisette so I made sure that this comeback to Boracay would include a day trip so I can finally try this adventure. Ariel’s Point Boracay was an all-in package of a whole day activity at the island, lunch and an open bar, snorkeling, kayaking and of course, unlimited cliff jumping. All for P2500. The tour starts at Ariel’s House at Station 1 where all guests are welcomed to chill while waiting for the boat. While at the boat, they already offer unlimited drinks! Ryan was one of the first brave ones to try it on the 8-meter platform, ikaw na! And he has the guts to try it at the highest point (15 meters)! My turn, but I only opted to try it at the lowest platform which is 5 meters. Actually, the lifeguard has let me try it on the 3-meter platform first as I was deeply terrified but I was determined to go on to the next level so I did it, yay! It took me about half an hour to convince myself to jump. I liked the Ariel’s Point Boracay package as a whole because the place was great, I love swimming by the clear waters. The only downside is that it had too limited time, it started late and they just let us wait for more than an hour for the boat to arrive, we could have enjoyed swimming and had more time to relax if we arrived earlier. And the food too was not so great, the meals offered for the island hopping was much yummier. Summer came in early this year when my good friend, Lei invited us to join them for an island camping in Caramoan. It is a place far far away from Manila and she told me that we’re going to commute so I thought that would be a long and tiresome trip but I gave in anyway, its a beach we’re going so I couldn’t care less. It was a 13-hour bus ride to the municipality of Caramoan so were totally worn out the moment we arrived at the town. Afterwards, we have to ride this big tricycle to reach the boat that would charter us to the island. I spent approximately P2500 for this trip. Before we arrived at the campsite, we went island hopping first. The place was so charming. The clear waters, however, was very shallow that time so we can’t enjoy swimming but the view is just so lovely so photo ops na lang. We had camping in Matukad island where we had the place to ourselves. We were isolated over the night as there was no electricity and signal, just our tents and lamps. It was my first time to go island camping so at night I was kinda scared because we were the only ones in that island and the townsfolk lives afar but over time, I was assured that the place is safe for campers. While there was still sunlight, we rushed on setting up our tents and prepared for our dinner. It felt really good to disconnect for a while where all you can do is enjoy the peacefulness of nature. It was a long long night so after dinner, we had some drinks and went swimming. And we had to climb these edgy rock formations to see the mysterious giant milkfish in a lagoon. The view on top gave us a wide panoramic view of the entire Matukad Island, so lovely! I saw a little resemblance of Caramoan islets from Palawan islands, although for me no place compares the beauty of Palawan especially El Nido. I’m coming back for ya.